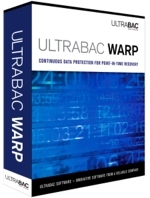 UltraBac Warp Server Edition is a point-in-time critical recovery application designed for end-users with minimal technical knowledge in mind. A form of Continuous Data Protection, this product uses Continuous Image Protection™ to protect all selected volumes rather than specified files and folders. This provides quick specific point-in-time (manually entered, selected from a graphical timeline showing backup activity, or from a bookmark) restores. In case a more catastrophic event occurs, bare metal restores can be performed, even to dissimilar hardware. The software is so simple to install a user can begin the backup process in less than 5 minutes. UltraBac Warp can back up and restore in as little as three easy steps, so literally anyone can be their own backup administrator. A first year Maintenance Subscription Agreement (MSA) is NOT included in the license price. It may be purchased separately at the time of product purchase. Discounted prices on second year maintenance are also available at the time of your initial purchase. With this annual contract, customers receive priority service and unlimited technical support. Software upgrades are also provided at no charge when downloaded from the UltraBac Software website.